Last Friday I was simmering in the hot sun, enjoying a nice cold beer as I took in an entertaining burlesque show at El Rio. This week, on an overcast, frosty Friday night I entered Nap’s thinking I should ask for a hot Tennessee Mud rather than an icy Pacifico. As I drank I willed the cloud cover to give way to the sun’s last opportunity to warm me up. My hopes didn’t get realized and the nippy breeze pushed me past a gentleman wearing a cowboy hat and boots who was busily swinging a large Maglite from side to side. For a quick moment I couldn’t tell if he was the bouncer or just some guy playing with a giant flashlight and having a good time singing along to James Brown on the jukebox. The bartender, Jesus, was doing his best impression of Danny Trejo. Donning a Nap’s 3 logoed vest and a two foot ponytail, he looked more like an off-the-strip Vegas card dealer than a Mission dive bartender—I mean how many dive bars have uniforms!? I attempted to strike up a conversation with him but he didn’t seem to be in the mood. 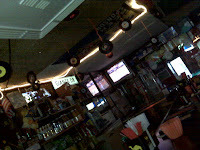 Nap’s 3, a self-professed sports karaoke bar was artfully decorated with promotional beer posters ranging from the lovely Budweiser girls to the NASCAR sponsored drivers. These cheap posters were in stark contrast to the 45’s, small disco balls, dream- catchers and the odd fly strip that dangled from the bar’s glimmering ceiling. I’m not sure what the “3” in the bar’s name is all about (I can’t imagine that Nap’s 3 is the third bar in a successful chain of San Francisco karaoke dive bars) but it certainly begs for an explanation. I’ll have to ask Nap, the owner, someday when I return to the place because on this particular evening he was too preoccupied with trying to fix the television and the karaoke machine to mingle with his customers. Nap’s 3 receives surprisingly excellent reviews on Yelp though on this Friday night it was quiet and I was joined by only a handful of other patrons. I figured there had to be more to Nap’s—so I made my way through the bar beer in hand as James crooned in the background. Migrating past two women who were sitting at the end of the bar and a lone pool player; I made my way through a small hallway which opened up into a large patio. 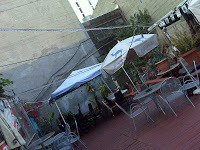 The spacious patio was cluttered with an accumulation of tables, chairs and umbrellas which was probably why it was vacant. Across the fence, the bar’s neighbor, El Rio, seemed to be enjoying a large backyard crowd as a steady stream of chatter and music cascaded over the fence. Standing in the vacant enclosure, I couldn’t help but think about this humble bar’s potential. 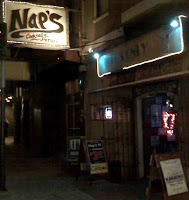 With so few bars in San Francisco having outdoor seating, Nap’s doesn’t seem to recognize that there is a goldmine in his backyard. In a daydream moment I thought about what I could do with a bar like this… back yard, pool table, great location. So much potential! Returning inside and settling onto my barstool I was once again confronted by the flashlight wielding buckaroo who was now enjoying a duet with Aretha Franklin as he sipped his beverage. By now I had confirmed that he was in fact the sheriff of this pub—maintaining law and order over the place while partaking in conversation with anyone who returned the favor. Before my evening drew to a close, a panhandler approached the bar’s entrance but was quickly turned away with a $0.50 handout in exchange for preventing his offensive odor from crossing the threshold of the bar. Shortly thereafter a hombre and his female companion came to the door pushing a stroller that had a kid inside and a bag of grilled corn hanging from the handlebars. I hadn’t seen the Corn Guy before and was once again astonished by the number and diversity of street food vendors that Mission Street employs. Nap gave a “maíz a la parrilla” shout out to his customers to see if anyone was interested … there were no takers and the Corn Salesman moved on to the next place. 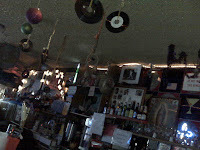 As 8pm approached Nap’s was still waiting to hit its stride while El Rio was humming with activity next door. I had to wonder if Nap’s ever lives up to the wonderful Yelp reviews because it sure didn’t on this Friday night. 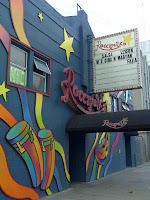 As I left Nap’s I took a quick look over at Roccapulco, next week’s destination. At 8pm the place looked completely closed but judging from its website, 10pm might be a better time to visit I’ll have to adjust my start time next week and, for the first time on my journey, be prepared to pay a cover charge. I enjoy reading about your adventures. I do agree that you need to go later to see anything of interest. I suggest you go back after 10:00pm to La Terraza(no cover on Fridays) and Club Malibu($10). I think you will see a whole different world at that time. Looking forward to reading more of your stories. Have to get there later to see the real thing.